5 Tips for Exploring Process Art with Kids! As an art teacher, there was never any doubt as to whether or not Stella would be immersed in the arts as a child! I started introducing her to art when she was four months old, and have continued ever since! I am often asked if I think she has "the gift of art," or some profound talent, and I just laugh. Art is about so much more than natural talent, and so far from what I'm worried about when I paint with my almost two year old! At this age, I'm all about process art with Stella! Process art simply means focusing on the process of creating the art versus the end product. Art is such an engaging way for a child to learn and manipulate. They're learning by experiencing color, texture, space, composition, and whole body movement just to name a few. I know personally with Stella, we are learning colors right now, so when she paints, I break out my giant bin of craft paint for her and she goes through and calls out each color as she selects them from the bin! Lately she's been experiencing a blue period! Hopefully in color only! 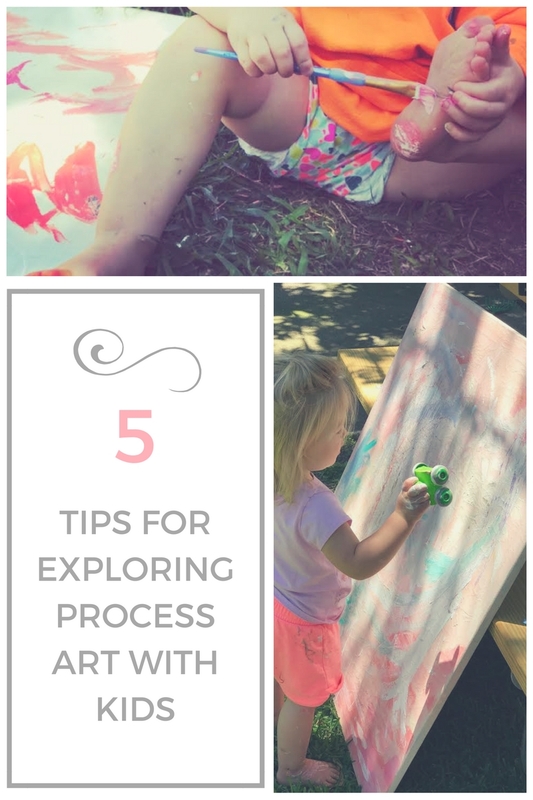 If you're interested in trying process art with a child, here are a few steps to get started! -Use what you have in your yard!! Nature provides some pretty amazing paint "brushes" and tools! We recently painted on old wood scraps using flowers, sticks, branches, and herbs! Not only does it create for unique strokes and texture in the piece, it also exposes your child to the various textures of nature! I also loved that when she used the rosemary as a brush, the stroke process released the oils, and the aroma added to the sensory experience!! -So for all of the mamas who don't like messes, this one is probably not for you! Stella frequently uses her hands and feet and sometimes her whole body to paint! Sometimes she dives right into the paint with her feet or hands, other times she paints them before applying them to the surface we are painting on! Its just a tactile way for kids to learn about how their movement can manipulate a medium!! -Trucks, balls, doll hair, plastic animals, etc..are all amazing tools! Who wouldn't want to drive their monster truck through paint and see what kind of tracks it makes? 4. TRY AN EVOLVING CANVAS! -One of the cool things I'm starting with Stella is an evolving canvas. This simply means that you continue to reuse the same canvas over and over to create a unique piece with layers of color and texture! Try buying one big canvas when they're on sale, and let your child come back to it over and over again! 5. TRY A VARIETY OF MEDIUMS! -Try a torn paper collage, watercolor painting, colored pencils, markers, crayons, oil pastels, etc... Don't feel like you HAVE to be using paint! We like to mix it up a lot and use a variety of mediums. Try using white crayons to draw basic shapes and then let your child paint over them with watercolors! It creates a wax resist and the image only appears when they've painted over them! Remember that there isn't a right or wrong when it comes to process art! Many times I'm amazed and the beautiful art that comes out of it, but that is never the end goal! Let them be little. Let them play, explore, create while they can! Share with me if you try any of these!!! I'd love to hear how you explore process art with your kiddo! !